Nicole J. Butler: "Living Truthfully": This relationship is NOT WORKING!! This relationship is NOT WORKING!! 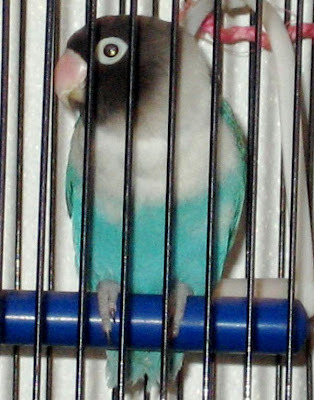 After my pet bird Lele died in December, I bought another lovebird. Socrates. Socrates is weird. No other way to put it. None. At first I thought he was just shy and had to warm up to me, Cupid, and Gherkin. I tried to teach him the "step-up" command. No go. He wouldn't step up onto my finger or a perch. He wouldn't play with toys. He wouldn't eat anything but birdseed. I kept trying. No go. One day he bit Gherkin. A couple of days later Gherkin bit him back. I decided I'd better keep them all separated until everybody warmed up to everybody. In the last couple of weeks it has become increasingly clear that this is not a good fit. I hated the idea of taking Socrates back to the pet store and having to wait for someone else to take him (to what would hopefully be a good) home, but over the weekend, I decided to take him back. He didn't like the other birds, they didn't like him, and there is waaaay more screaming and screeching than I can live with. I had planned to do it Tuesday, but got busy. Today, in a last-ditch effort, I let Socrates hang out with me. He sat on my shoulder for a while, didn't try to bite, and when I put him back into his house, he played with his toys. What?? Maybe this will work after all. THEN I hear Cupid scream LOUD. I ran in to see what was happening - Cupid kept screaming. I opened his cage & he fluttered to the floor and started walking around. That's when I noticed the blood. Every step he took left a little trail of blood behind. I picked him up, and carried him into the bathroom. I grabbed a Q-tip, the witch hazel, and aloe. That's when I realized that the tip of his toe was hanging off. We did go to the vet (in the pouring rain, in rush hour traffic) and when the vet saw his toe, she got right on it. I just KNEW he was going to lose his toe, but she managed to bandage it. How you bandage a bird's toe, I don't know, but she did it. When she brought him back out, he was saaaaalty. Wouldn't look at me, chirp, talk...nothing. He had been trying to chew the bandage off, so she put one of those collar things (like they put on dogs and cats) on him so he couldn't get at his foot. I'll spare you any additional details, but suffice it to say that he's currently trying to chew the collar off and still won't speak to me. Socrates is going back to Birds Plus tomorrow. I'm sorry, but dude can't stay here behaving like a savage. This relationship ain't working.